Yesterday i.e 24th Oct 2017, the Finance Minister announced that the Government would infuse Rs.210,000 Crore into the Public Sector banking system, which is basically an effort to save the PSU banks from the deteriorating NPAs (Non-performing assets). As you can see, the PSU Bank index shot up 27.75% at opening. Punjab National Bank’s 160 Call option expiring on 26th Oct 2017, shot up 20,600% overnight! If you had bought 1Lac worth of option on 24th Oct, it would have translated to 2.02 Cr on 25th Oct morning. So clearly, there is a lot of action in the market today. Considering this, my colleague and I decided to write a short strangle on Bank Nifty and collect a premium of close 253 points per lot, obviously hoping that the volatility would die and premiums would reduce. However, I want you to think about the thought process behind this trade. The trade idea originated through what I consider as ‘systematic deduction’. To make such systematic deduction and find opportunities, you need to question what is happening in the market and sometimes be willing to take contrarian positions, which is exactly what we did. None of the above mentioned ‘approach’ to trade the market, including the ‘systematic deduction’ can really be defined as a process. These are ad-hoc methods, which cannot really be quantified or backtested. Any approach to trade where you cannot really define ‘the approach’ as a process is not considered as a trading system. On the contrary, if you can define the approach and can quantify the process to trade the market, then you are essentially talking about a ‘Trading System’, which is exactly the focus of this module. 1.2 – Trading system – the Holy Grail? The moment you talk about a trading system, people generally tend to think of these systems as a sure shot technique to make money, or in other words, they approach these systems as a money-making machine. They expect profits to roll from the first trade itself. Unfortunately, it does not really work that way. Remember, a trading system receives a bunch of inputs from your end, performs a set of task, and gives you an output. Based on the output, you then decide (or the system itself decides) if this is a trade worth taking or not. So the onus of making money really depends on you. The advantage of a trading system, however, is that – you only have to decide the logic once and then just follow the system that you’ve designed. Of course, as you may have sensed, I’ve dumbed down the journey of a trading system to a large extent, and this is just to give you a perspective at this stage. 1.3 – What to expect from this module? There two techniques to pair trade – a simple approach based on correlations and a slightly complex approach using statistical concepts – both of which we will explore. Of course, as we proceed, I may try and add other trading systems as well. However, this module will not include the ‘backtest’ bit. The onus is on you to backtest the system and figure out if the system works for you or not. You will have to take the rules of the system and figure out how many times in the past it has worked and if it has worked, what kind of profitability pattern the system is showcased. Remember, no trading system is complete without having the backtesting results. The only reason why I’m not including the backtesting part is that I lack programming skills. Some of these systems can be efficiently backtested if you can manage to write a piece of code. When these systems were developed, I was fortunate enough to have a fellow trader with programming skills, hence I was in a position to get greater insights into these systems. I must also tell you that these were fairly competent systems to trade – and I presume they still are. Of course, the market conditions have changed, hence a fresh set of backtesting is justified. However, the broader objective of this module is to showcase different systems and give you insights into how systems are developed. Hopefully, this will inspire you to develop your own system and perhaps works out to be your own money making machine! With this hope let us proceed – onwards to Pair trading! Very much excited to see the much awaited module live.I just have one question. I know you have already said that you do not trade naked options, but why not take a bull call spread or some other aggressive bullish trade on some top PSU bank’s options, as it would give you maximum benefit or am I missing something here? I am just an option beginner and trying to know the way pros like yourself think. Thank you. Sir u said 4 trading system will be dealt with, but in whole module ony pair trading is discussed when can we expect the other 3. These will be much shorter chapters though. PDF will be available once the module is complete. This module is work in progress. Thats is a hard call, Ravi. Maybe you should apply the volatility concept and get a sense of where the expiry could be. Or something like max pain. Sir, I was expecting a module on personal finance? As you had said earlier. Thanks for the understanding, Umer. Yeah, I want to build my own trading system. It should needs rules and regulations. I eagerly awaiting to learn your lessons. hurrah!!!! Hope your wait is worth its time! Karthik, If you don’t mind, can you give details of the trade setup you did for the mentioned banknifty ? Ah…it was nothing fancy… a straightforward short strangle with 24000 PE and 26000 CE. Both will take some time. Ok Thank you Sir ! Work in progress, Vishant. PDF will be done once complete. 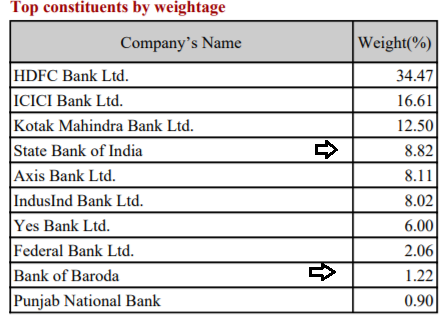 Its really weird that only 10% of the PSU banks contribute to the Bank Nifty Index and Bank Nifty surged 3 % ! 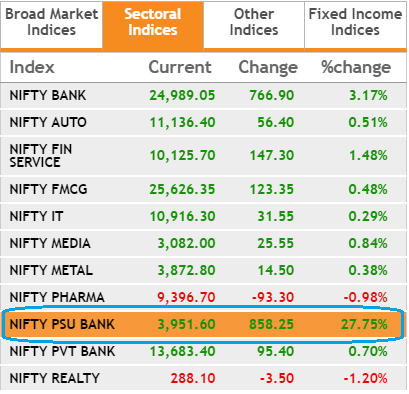 Do you think someone is manipulating Bank Nifty Index to their favor or is it actually happened because it is not possible. Its really hard to manipulate indices like Nifty and Bank Nifty. Desperately waiting for pair trading module! This is my first post and I want to thank you first as I have learned most of the trading concepts and strategies from your modules at varsity. I am eagerly looking forward to this module as I have plans to build a trading system and put my programming skills to some use. I know it is really hard to predict the stock market moves but just asking what you think should be the ideal success rate of trading system. Like you said – it is a hard question to answer. I’d look for 60% at the least. Pi is a desktop application, no mobile app. Sir when you gonna post pair trading module? Starting soon..next week I’ll try and put up the 1st chapter. It is great to figure out someone who thinks like me.I am too excited by the way you write the module in easy to understand way.I some times trade on the basis of contrarian view .Well you have just given me an Idea for my P.hD thesis,which will in Behaviorial Finance and will try to figure what guts are, and to investigate the noise which affect trading decision in India. This is my first post here. But I must admit I am a huge fan and follower of ur work. Infact I have learned a lot from varsity, the very foundation of my understanding of markets is varsity. All due credits to you and team zerodha. I have an active account with zerodha and have referred a few friends to varsity and zerodha as well. Many congratulations for the new module. Really looking forward to it..! The appetite for knowledge of your followers has surpassed your capacity to produce quality work here. Congratulations! 2) Am I missing any of the important factors before choosing one? 1) Look out for the index fund’s fact sheet, usually, availave on the Fund’s homepage. Some options had better results than the PNB one. SBI OCT 280 CE had some 27,000% and 300 CE some 40,000% gain. On the same fateful day I entered a short strangle after the market opened and price of SBI stock looked to stabilize of SBI 280 PE & 320 CE and burnt my fingers badly as I had to buy back my call option at a very high price. I think he did it towards the end of the day when prices had stabilized. Not at opening. But he did it for the index which had unusually high volatility even tough PSU’s had less say on Bank NIFTY. Hmmmm, touching stocks which have fundamental news around it is a tough call. Its better to stay away if – especially in situations where its hard to assimilate the news flow. They are modules, Gunjan. Chapters are whats inside a module. PDF will be up in a months time for Module 9. Is there a module here which explains about investing in mutual funds? I was curious about Coin of Zerodha. If yes, please do comment the link for the module. Not as of now, Satyaki. Hopefully, the next module will be on MFs! In some previous comment you said that you would look for atleast 60% win rate. But i have a question, for how many trades should we decide that the system is given 60% win rate or more? The number of trades does not really matter, as long as 60% of the trades are winners, that’s what I meant to say! I read few books on trading systems and they all say that all trading systems have some edge over others. How true is this and if yes, what kind of edge are they talking about? Sir sorry to bother you again. But when you say intelligence are you talking about back tested results? Not just the backtested results, but the actual technique which triggers your buy and sell signals. Team Varsity, you have done some really great work by designing such a great platform for retail trader for free. thank you very much for such great efforts.. can you launch google playstore app of Varsityzerodha. in which we read online and offline content on zerodha varsity instead of providing pdf copy.so we should read on zerodha platform instead of third party App (for pdfs). we also like to click on adds shown on this zerodha app as token of love from our side. i really want that u should design app for varsity and Q&A for greater mobility……. once again thank you very much…. I know you aren’t the right person for this, just thought you can cascade this to the right people like Nithin Kamath. Lots of issues in current version of Kite in the past few days. What is happening with Zerodha applications? I called the support team and they weren’t of much help except for saying some backed up-gradation work is going on. How can that be allowed to affect the front end. It affects people like me a lot. For example in Kite application, the positions tab is not reflecting “Average Price” and “P&L” at all and “Change” shows as NA. It shows as 0. You might want to look into the issue. I think the issue is common to many users, even my friend is facing the same problem. Also average prices are shown wrongly in the Holdings tab. Sir can you please make a module on trading plans and trading strategies for beginners. Especially for regular stocks rather than the Derivatives. I am new to stock trading and I want to stay away from Derivatives untill I get a hang of trading. I would really appreciate if you such a module comes out on Varsity. Sure, Ashish. This sounds like a good idea. Will try and build some content around that. And thank you so much for helping us spread the word. Hi karthik,I have a doubt many People say that everything in market is manipulated by big institutional traders,that is why almost 99% retail traders lose money success percentage is very low there is also a belief that the index like nifty and bank nifty are also manipulated in their favour.is this talk really true?please explain briefly about this manipulation which is eating the retail traders wealth and health?can the index be manipulated? There is no manipulation. People lose money because they do not have the kind of patience or discipline that the institutional investor has. Not for any other reason. As always great educational topics been discussed by you. I have been trading for some time in options , using strategies. Can we have a session on bitcoin and how to trade on bitcoin-I have been hearing a lot but know nothing on bitcoin- would request you to throw your intelligence on the subject. Also can we form a wats app group –where you would discuss your profit making strategies ( I know I m sounding selfish). One more thing karthik–can we have a trigger in our mail box, whenever a new topic been discussed by you. Yes Mayur, its roughly around those lines. Will try and do this in excel. Sir how does one decide on what strategy the trading system should be based on? As you said there are so many trading strategies- Pairs trading, momentum etc. How should one go about selecting a trading system? Thanks. A good trader usually has 2-3 strategies and masters them to perfection. So you always trade these strategies, based on the opportunities that come about in markets. Thanks for the reply sir. Would you be comfortable telling what kind of trading systems you personally use? Thanks. I use a mix of strategies, including Pair Trading, option writing, naked futures position, long-term investments, TA based trades etc. Will zerodha ever be listed on any exchange ? Are you doing anything for making kite /PI (for options trading – currently we can’t view live Greeks /net position Greeks in kite /pi- at least make this thing available if not rest ) as sophisticated as think and swim ? I am the beginner in this field & hopefully going to complete my CA in Coming Jan & want to make my career in this field but don’t know how to start, Should i get training somewhere for this or should i start to analyze at my own ?? Good luck for the upcoming exams in Jan, Manish. I’d suggest you start making your own analysis. This will always help. Is there any app or something.?? I personally keep the company name in Google Alerts, so whenever something happens, it shows up in my alerts. Sorry for posting here, but mobile kite application is not working from 2 days in android platform. Please suggest what to do??? ?? It is working like a charm, Saurav. What issues do you face? Sir is there anything zerodha is doing about back testing, even for those who don’t have any coding knowledge? Yes, do keep a close watch for an announcement around this. Hopefully will soon start earning.. I want to know that in case i short sale nifty 50 index suppose on last day @2 ( 1 lot for 10700 nifty call) and before closing i wont able to buy or their are no buyer for the same then what will happen/ be consqunce. ?? Thanks for response, will any penalty wud be charged bcoz I haven’t buy after short selling..?? Sir I have a very important question about stop losses . In the above trade, say I was the option seller of PNB Oct 160 CE and I had placed a stop loss at 5 rupees below the sell price. How do I manage against drastic market changes like this? The price wouldn’t hit my stop loss as it opened at a much higher price. How do traders protect themselves from incidents such as this? This is a practical problem and a risk inherent in placing not just SL but any limit order. There is no guarantee of execution. This is where market order scores over limit orders, but the prices you get in mkt order can be quite dissapointing. Just what I thought too sir. So in such cases, what can a trader do to protect himself from such black Swan events? Sir I know this solution might not be feasible. But do you think holding the same number of underlying stocks bought at a much lower price say a few years back would act as a hedge for such black Swan events? That is as good as a buy and hold strategy. Not really a hedge. But yes, in a sense, the only hedge against market volatility is time. 1) If I have leveraged 10 times by shorting future contract on a particular day and then next day that particular stock has gap-up opening of 20% because of uncertain situation like the above mentioned news. So, in this type of trade how is trade cash settled assuming investor who has shorted doesn’t have money to pay. As it is zero sum game, who is gonna pay to opposite party? Is that SEBI or broker or government? 2) If I’ve 1000 lot of PUT In the Money options and then war breaks out. In this situation, every PUT writer will try to close their position. But now, everyone has conviction that the worst situation will prevail and the worst of market is still to come. Finally because of liquidity crunch, situation is like only the OI for that particular series is 1000 lot. Then will I be forced to close the position by regulator as the put writer is facing problem with margin amount and he is not able sustain financially that trade by putting extra required margin amount? or Is it regulator gonna take hit of lost amount? 1) The risk management team would cut your position in situations where it starts making losses over an above the margins parked. 2) If you have 1000 Put short, then there will be someone who has bought these from you. As long as you have an open position, someone else will also. So regulator will ensure money is transferred (or settled) between both the parties. Remember, the seller has margins parked already with the broker. Please upload the complete pdf for module 10 so that we can learn from it . Module 10 PDF will be done when we finish the entire module, we are still a long way from it. I want to clarify a doubt regarding brokerage . My Order : 10K Shares of X Stock. Since its a single order, the brokerage would be 20. Sir, exact tell which book is best of van k Tharp….. The one on position sizing – Definitive Guide to position sizing. You have done a tremendous and excellent job. Thanks a billion for putting all aspects together in orderly manner. May I request you to convert Module 9 and Module 10 in PDF formats? Staring at computer screen for long time strains my eyes so it will be easier for me to read from the paper. Appreciate your help in this matter. Thanks for the kind words. Module 9 is already in PDF, Module 10 will be in PDF once the module is completed. Hello Sir, I am new to trading but have good python programming skill, so for starters I am trying to create a simple EMA crossover system. I backtested my strategy on NIFTY500 shares and shortlisted the ones with high %profit average and total-traded-value rank greater than 50. But I found that my selection process is correct. So how to select shares for a my strategy? Can you point me in right direction? ***correction*** Hello Sir, I am new to trading but have good python programming skill, so for starters I am trying to create a simple EMA crossover system. I backtested my strategy on NIFTY500 shares and shortlisted the ones with high %profit average and total-traded-value rank greater than 50. But I found that my selection process is not correct. So how to select shares for a my strategy? Can you point me in right direction? Posted the reply to your earlier query. Nifty 500 is perhaps the best universe as they have maximum liquidity. I’d suggest you stick to this, but maybe you should look at tweaking few variables while back testing. can U elaborate on ‘ tweaking few variables’ sir, I am testing for intraday 5 minute timeframes, 9 x 21 crossover, backtested for 21 days then filtered the shares like I told before, again backtested the filtered shares for next 7 days, 14 days like that, but mostly ended up with brokerage loss. can you also suggest number of back test days sir? can you also suggest number of back test days sir? what I did was, I backtested for 35 days filtered shares based on test result,then I backtested with filtered shares for next 7,14 days, is this the right method Sir? Backtesting is best if done for at least 2-3 years. Mani, in case of a trading system’, you will have to assess the risk-reward on the basis of the entire system and not really on a ‘per trade’ basis. You assess the risk reward on a trade to trade basis when you are trading based on say candlestick patterns. Hello Sir, thank you for all the guidance so far, regarding risk reward ratio for entire trading system, how to calculate that for ema crossover system? correct me if I am wrong, if my avg pnl is 1 and my stoploss based on volatility is 0.5 then ratio is 1/0.5, is this the way or is there any other way? Yes, you basically have to estimate the ratio which helps you understand how much risk you are taking for every 1 Rupee of reward you expect. Sir with your help back tested and selected the stocks to trade in my EMA crossover system, I do understand that it is a beginner level trading strategy, can you suggest a trading strategy or a system(maybe 2 or three). Also your suggestion of ‘Inside the black box’, by RIshi Narang was very helpful, gained more insights. Mani, I would be writing about the systems in this chapter itself. Request you to please stay tuned. Thanks. I know this is asking too much sir, but is there a way to send private message,so that I can send my detailed test results or discuss my strategy in detail. Mani, I’d love to look through it, but unfortunately, time does not permit me for this. tough luck for me Sir, anyway can you suggest some books to learn quantitative mathematics for trading. Hard to point to one book. Although not a ‘Quant’ book, I’d suggest you get started on ‘Inside the black box’, by RIshi Narang. I can’t find a download PDF link like Chapter 1-9, can you provide one? The PDF will be ready once the module is complete. This module is still work in progress. How many chapters are going to be in this Module? Do you have an approximate date by which you will make the PDF available? Pair trade has couple of chapters more. After this, I plan to discuss Dynamic Delta Hedging with options. Can’t really comment on how many chapters more. how much money do you think sufficient to make money in F & O trading? another one, is it mandatory to file returns even if my net P & L is in negative? if yes, then, is there any means of help from zerodha to get it filed? I had some doubt about the buy back offer. Recently Balrampur Chini announed a buy back at Rs. 150 per share, not sure when but the share price dropped to 75 as of today. 1. Why is it so, shouldn’t the price instead of decreasing should atleast come to the price of buy back offer, because I can always buy the share at this price and sell them for buyback. 2. How complicated is the procedure and how much chances I have for the buyback. 1) This is not the best case for buyback as the shareholders if at they way to participate in the buyback, are better off buying it at a lower price in the open market. 2) Not really complicated, you can participate online…and the chances really depends on the scrip. When can we expect a module for Algorithmic trading/ HFT? The present focus in on Trading Systems, Riya. I guess after this is a module on Mutual Funds. I’m not sure if we will do a module on HFT. Please plan a module on algo trading/HFT for future. I’ll probably have to take some external help for it, will try my best to do that, Riya. This module is still work in progress, PDF will be available once completed. Hello Sir, is the historical data provided by NSE adjusted for corporate actions? Yes, I think so, Mani. Sir, I have a doubt in calendar spread strategy, I have created a trading system that is able to find all the available trades and also an execution based entry system, but I am unable to find a quantitative way to determine acceptable price difference range to enter and exit trade, which I am doing manually now. I do understand that there is doing to be a topic on calendar spread in the future but can you give me some pointers here. Mani, once I’m done with pair trading, I’d take up calendar spreads. That will give you some insights into how to go about trading the calender spreads. 1) I was thinking is it possible to form a company that would invest other peoples money(family members)? 2) What is the type or structure of company I should form? spoke with few auditors in our town but no one was that knowledgeable about trading. I am located near a tier 3 city so your guidance would help me to move in right direction. Mani, the only legal way to do this is by taking up a PMS license. Unfortunately, you cannot do this otherwise. Sorry sir, was caught up with an urgent work so couldn’t reply. Isn’t it possible to create a company that pools other people money and invests sir, by charging some percentage say 30% of profits as fees. No Mani, this is not possible. You need SEBI’s approval for pooling this. what kind of permission sir, is it cumbersome process? because I am finding it tough to keep track of markets as well as to place trades in each of the demat account. If you intend to place trades and manage the account end to end, then you will need the PMS license. If you intend to give just advise, then an RIA license will help I guess. Kindly, provide PDF for Module 10 i.e. Trading Systems. The module is not complete yet, Ankur. We have suspended adding new chapters for some time. You have taken a example of PNB option. Suppose someone had purchased that option, now on next morning with 26000% return, he want to square off his position. Will he able to do it ? Or Zerodha RMS will generate some exception like ‘option strike price based on ltp percentage…’ or there is some circular from nse which prohibite broker to execute such order ? In case nse don’t stop and Zerodha not able to execute order then by switching to some other broker like sharekhan will solve the issue ? Yes, you will be able to sell it without any exceptions. But sometimes we are not able to buy far OTM bank nifty option and it generate some kind of error message. On googling that error message, got to know that Zerodha crosses uper limit of 15% from ATM, so you can place only OTM option. In that case someone with huge profit won’t be able to square off his position. Not really, we put a restriction on buying deep OTM option, so you won’t be able to buy these weekly expiring, bank nifty options. Only on buying not on selling right ? But why these kind of restrictions ? And these restrictions are only for bank nifty ? Do other brokers also put these kinds of restrictions ? No fresh positions are allowed, Waqaar. The broker has a 15% OI restriction, which we breach, hence the restriction. Not sure if other brokers have as many active traders as Zerodha does. The module is not complete yet, Parmesh. PDF will be available once it is done. What is a ideal backrest period for a trading strategy sir? Depends on the strategy. I’d suggest you use https://www.streak.tech/ for backtesting. I am using kite API to create my own also sir, generally my backtest period is 2 years for 1 day OHLC charts. is 2 years reasonable enough sir? Yes, especially if you are looking at short-term trading. Where one can get details about quarterly results announcement timings sir? Check the company’s website, in the investor’s section. Sir is there a way to hedge option writing strategies like straddle,strangle etc for black swan event? why i was unable to download module 10 ?? The module is not yet complete, Ricky. Please provide any link or source to know about hedge funds in india. Unfortunately, the HF universe in India is super tiny, hence not much data points around this. Also, I dont know if there is anyone aggregating information. Yes thats why i asked this from you . By the way i think these are classified as category 3 Alternative investment funds.?? Can I please request you to prepare a module on Day trading ( F&O ), it will be highly appreciated if you can help us out with Day Trading strategies, how to select the stock for Day trading, ( both for futures and options ). Also, just wondering is it any good to trade ETF’s ? ( both day trading & swing trade ) ? Does it has enough liquidity, and is the cost to trade ETF high ?? However, I’ll try and put up a module on this sometime soon. I’d suggest you don’t trade the ETFs, liquidity is still an issue. No PDF of this Module ( Trading Systems) is shown for downloading…..????? Is Zerodha selling the Pdf of ALL Ten Modules…..in a Book Form…..????? a more readable BOOK form is required…. Hello sir, while backtesting a trading system I found that the strategy generates nearly 800 trades in an year and average profit is around 0.08%, if I add a slippage cost of 0.1% to buy price then the total pnl becomes negative. Is it advisable to add 0.1% slippage cost to the buy price for this system with small average profits? YOu should avoid this system, Mani. Slippages are real costs that you incur and you cannot afford to ignore these costs. 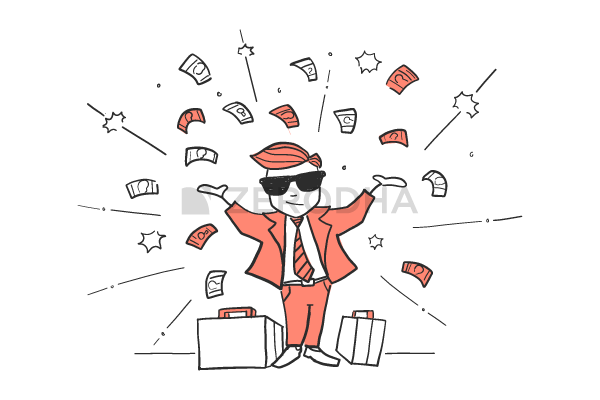 Hello Sir, I want to congratulate you and Zerodha for becoming number one brokerage firm in India, I have been with Zerodha for past 5 years, and when I look back I am amazed that, I have grown so much as a trader. Varsity is a great initiative, varsity and you sir have become an invisible mentor , guiding me. Hello sir, is there a way to calculate slippage cost instead of assuming some value? That would be difficult to estimate beforehand, Mani. The NA issue is occurring every now and then and each time we have to remember the average cost this is very unprofessional and callous approach of Zerodha. I do not understand why we have to do it. The system of zerodha are pathetic and is not at a Professional level of stock market trading. Few days ago NA issue occurred in few of my scripts and i have reset the average price. Today it is showing NA in all the script. I have total of 33 scripts do you expect us to this all again. Immediately fix up the issue so that no problems are faced. Hey Vikram! We are looking into the issue. Will ensure this is fixed before tomorrow ‘s market opening. Regret the inconvenience caused. Please collaborate and do some industry relevant certification courses.. Thanks, Mohith. Will consider this. Sir, please upload a combine PDF file of all 16 chapters of Module 10. like you have uploaded in 1 to 9 Module. Will get this done soon, thanks Jayesh.